^ a b Sepkoski, Jack (2002). “A compendium of fossil marine animal genera”. Bulletins of American Paleontology 364: p.560. オリジナルの2013-02-26時点によるアーカイブ。. https://archive.is/cYGWq 2010年4月6日閲覧。. ^ Wardle, CS and Videler, JJ and Arimoto, T and Franco, JM and He, P (1989). 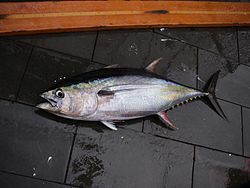 “The muscle twitch and the maximum swimming speed of giant bluefin tuna, Thunnus thynnus L.”. Journal of fish biology 35 (1): 129-137.